Today, brands are facing increasing pressures from tough competition, making retailers strive even harder to increase store productivity. Brands need to take a fundamentally new approach to sales and product placement strategy, and quickly. To stand apart from the crowd and grow, they must take control of the in-store experience. The effective use of product display, demonstrations and shelf placement is a science. The better a brand can do it, the more sales they will make. It’s not for the timid, however—precisely where and how product promotions are positioned can either send sales through the roof or fail to propel them to their full potential. It’s important for brands and CPG companies to understand how the general consumer thinks and acts when they enter the store, and to continuously monitor consumer trends and foot traffic. Product layout and displays influence both the shopping atmosphere and shopping behaviors of consumers visiting the store. The proper allocation of product on shelves, in particular, does not only minimize the economic threats of empty shelves, but it can also lead to higher consumer satisfaction and contribute to positive product sales. Retailers should consider many factors when determining the ideal position within the store for their merchandise and displays. For instance, research has concluded that products placed in the center of shelves are more likely to be noticed, and this position ultimately increases sales. Eye-level is prime real-estate, followed by waist-level, knee-level and lastly, ankle-level. Brands and retailers might also consider experimenting with placing both high selling items and slower selling items at eye-level, to see which approach yields higher overall sales. Other studies suggest that consumers scan shelves from left to right, beginning at eye-level and then working down. Since most people are right-handed, their eyes typically drift toward the right-hand side of an eye-level selection. This shelf section is considered one of the top spots to secure. Many savvy brands and retailers are taking this into consideration when laying out in-store product placements, and are asking their retail reps to map entire store shelves regularly. In-store demonstrations also assist in increasing sales for specific products. They help to promote the product by offering consumers product trials and free samples. Food promotions such as wine, especially, can achieve a positive influence on sales. Product demonstrations conducted on the same product as in the product display usually see the best results when the two promotions coincide. The in-store display is a highly effective way of simultaneously branding and giving information. Displays can also help you highlight your brand amongst competitors and achieve brand awareness with significant impulse buying potential. For example, the cosmetic brand retailer, Kiehl’s, designed a fun and memorable in-store display for the launch of their new line of fragrances. The display offered a unique customer experience where each fragrance was associated with an exotic travel destination and enticed customers to pick up the bottles to reveal more information about the origins and ingredients of each scent. When a bottle is picked up, a small biplane is projected and flies across the table, from the fragrance location to the accompanying country on the map. The customer can interact with the table and click through to see an animation featuring flowers, fruits and other ingredients in the perfume. After experiencing one bottle, visitors are tempted to interact with and explore all four fragrances. Providing a consistent customer experience across thousands of locations in different retail chains is not easy. Ensuring that products are placed on shelves properly and displays are set up correctly (if at all) is especially difficult for brands with products in stores across the country. Leading companies often establish a system to guarantee that their brand is represented in the store as intended. Brands today need well-trained sales associates, fully stocked shelves and marketing programs to be executed on-time to capture the attention of customers. A consumer brand field execution platform can help brands ensure consistent, measurable in-store performance and a seamless customer experience across all stores. Field execution software can also provide a better understanding of foot traffic, store tidiness and product placement in stores. A robust retail execution and workforce management solution like Natural Insight can provide flexible modules for retail task management, scheduling and project completion tracking and quality assurance to ensure quality execution of product placement and in-store promotions. Consumer behavior and the retail industry are constantly evolving. In this era of quick shopper decision-making and the increasing emphasis on the in-store customer experience, even the most successful product placement strategy must be updated. The importance of product placement marketing in the retail world will only continue to increase, and brands can no longer afford to stand still. 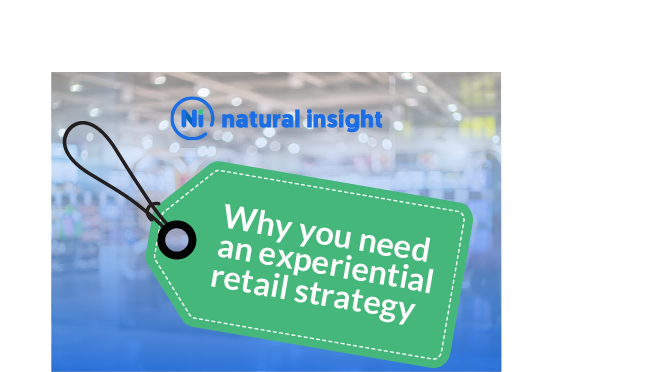 Schedule a demo with us today to learn more about how Natural Insight can help you improve your in-store performance to stay competitive in the ever-changing retail landscape. Want to stay up to date with the retail industry? Caroline Lane is the Director of Marketing at Natural Insight. Prior to joining Natural Insight, Lane was a senior marketing manager with Aquicore, an energy management software system for real estate portfolios. Lane was one of the company’s first ten employees hired and was responsible for building Aquicore’s marketing strategy from the ground up. Lane also previously worked at Renault - Nissan where she helped the automobile manufacturer penetrate more than 14 Asian and African countries. She has a Masters of Science in Management from EMLYON, one of Europe’s top ranking business schools located in France.